Finding truths, cultivating love and searching to reach my highest potential as a human being, is my purpose. This is how Maïka Zayagata likes to describe herself when you land on her website. 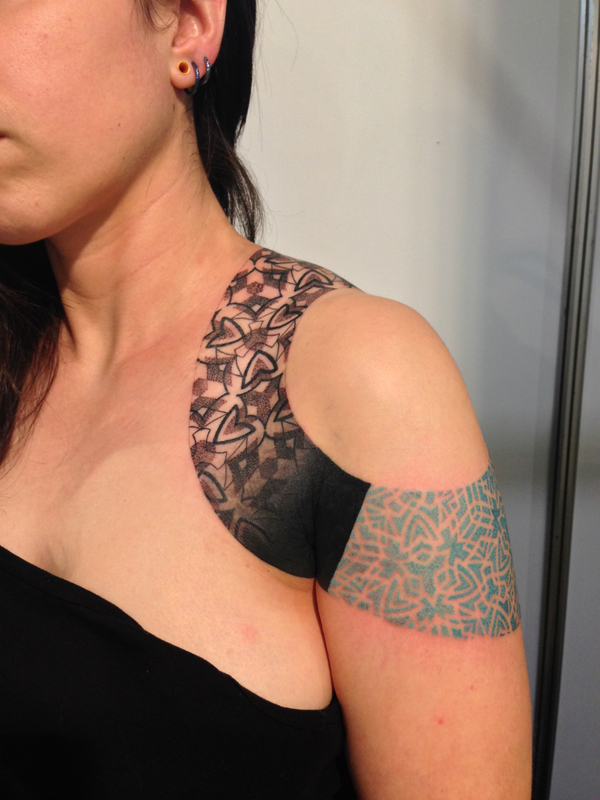 One of the shining lights of modern, avant garde tattooing; Maïka is well known in the tattooing world. 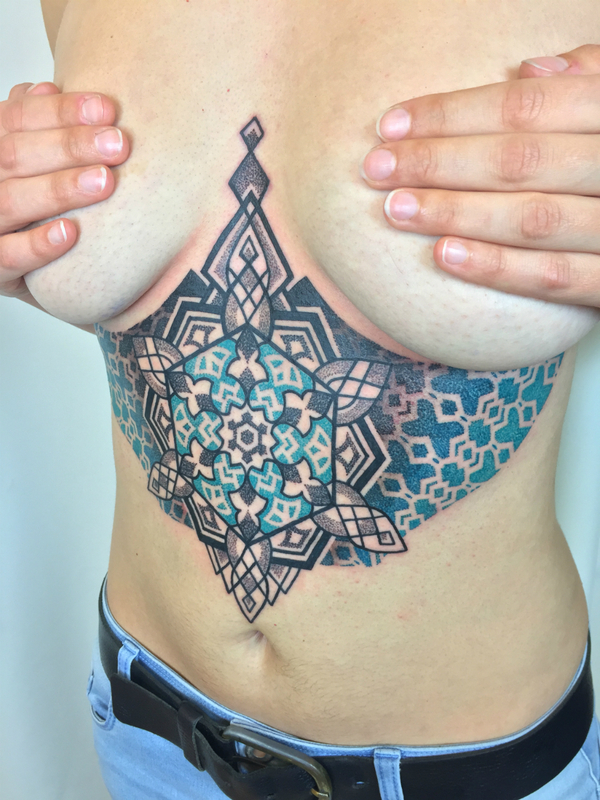 Her breakthrough tattooing in the realm of industrial geometry and the fusion of traditional practices with modern technological innovation have enabled her to carve her own niche and the ever-growing world of tattoos. 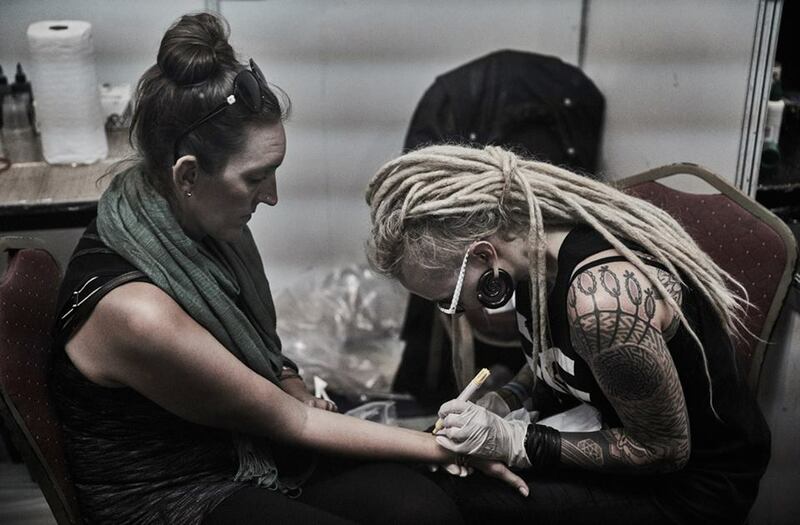 Winner of numerous awards at reputed international tattoo conventions, and a reverred name in the industry, Maïka is the queen of calm I have come across. 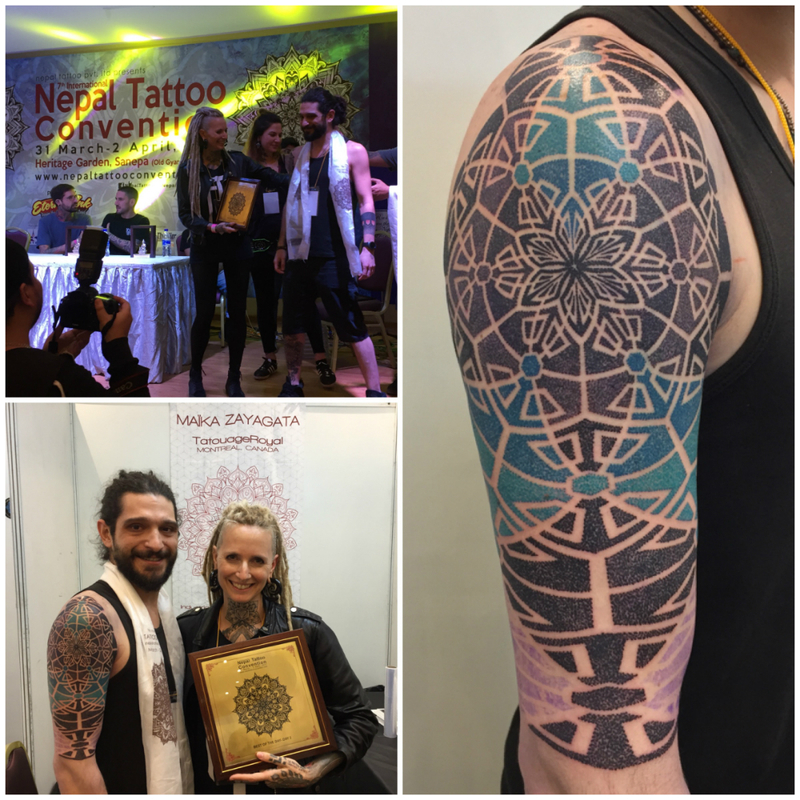 Having seen her tattoo and have fun at the last two Nepal Tattoo Conventions, trust me, I have seen very few artists who seem to work in the convention atmosphere with as much ease as her. Her art is depicted by a lot of different elements of geometry, and she derives a lot of inspiration from the environment around her. 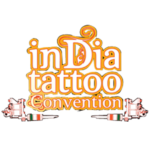 Shubham (S): How did you get introduced to tattoos in your life? Maïka (M): I started noticing tattoos in my early teenage years, but they mostly were about bikers or musicians at the time. I got my first tattoo at 17. So, I must say that my first tattoos were more about an act of rebellion rather then an art collection as it is today. S: How did you become a tattoo artist? 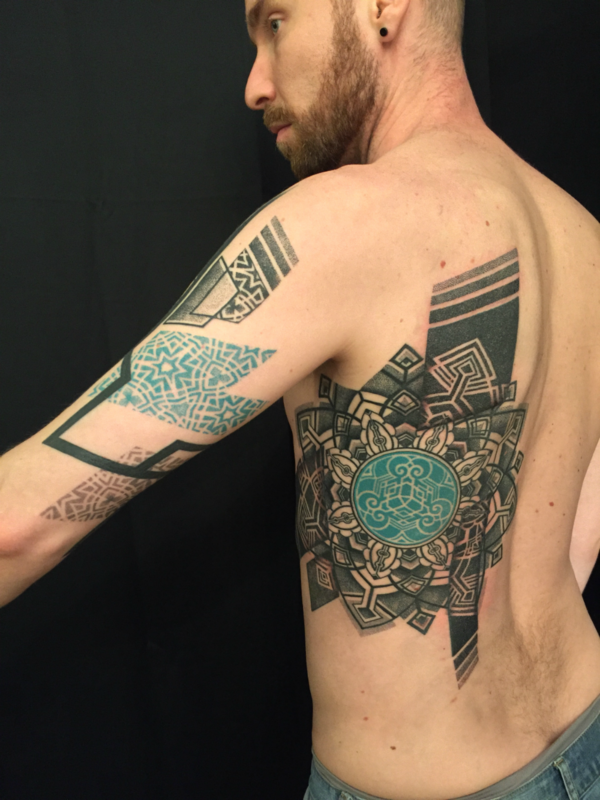 Why tattoo art? M: Since I can remember, I always drew or painted. My mother is a painter and taught me starting at the age of 9. So, art was always a part of my life. In high school, I was top of my art classes, along with 1 or 2 other students. 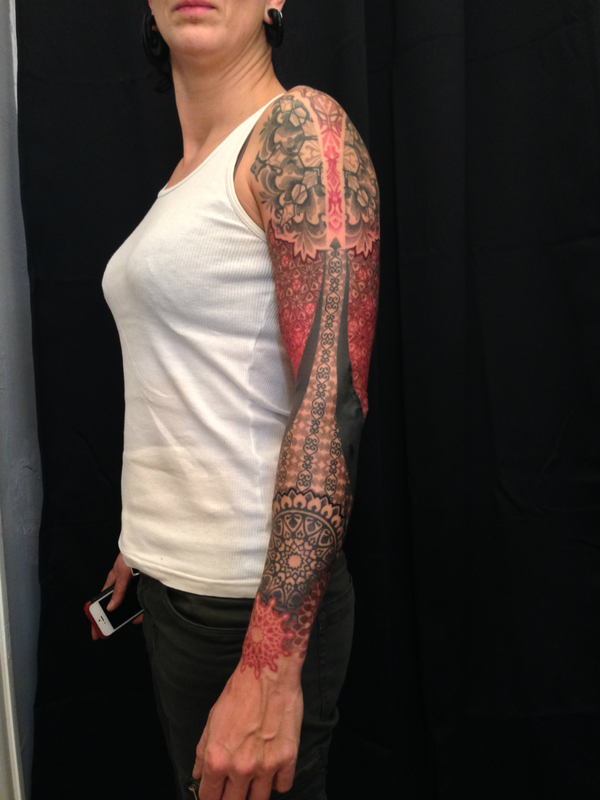 But it was much later that I connected tattooing with art and started my journey as a tattoo artist. 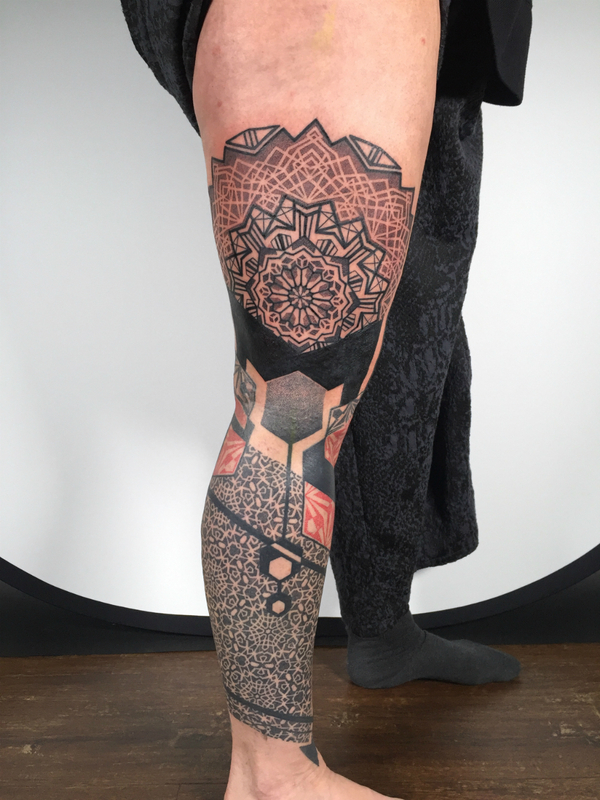 I am mostly self-taught, but I did have help from a couple of tattooists in the beginning to guide me through my first tattooing years. Then I found work in a busy street shop where I had to learn quite fast. But where I really started to learn was when I hit the road few years back. 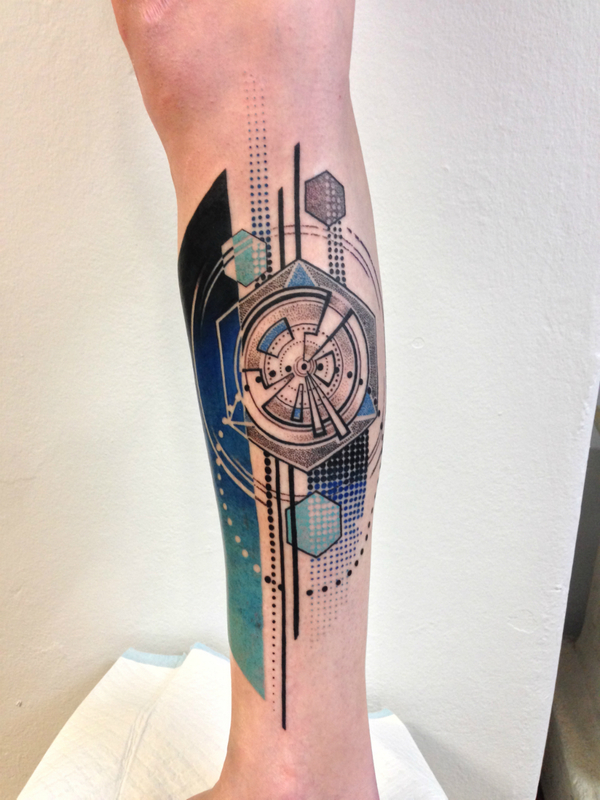 S: You describe your style of tattooing as something that finds resonance in industrial geometry. Can you elaborate on what exactly is the crux of industrial geometry? M: I use the term “Industrial” geometry because a lot of my inspirations come from urban, technological and industrial imagery or art (a lot of architecture, sculpture, photography, painting, etc…). Also, for me, there’s an obvious relationship between industrial geometry and technology. I think technologies are a wonderful tool to create art. Some people like to use painting brushes, other likes to use their computer, I am more of the latter. Which is best? Neither, I’d say. A tool is a tool. Each artist uses the tool that makes them excited and that pushes their inspiration and art forward. I get excited about technologies. 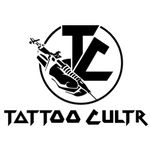 S: In this day and age, where the meaning and idea of tattooing is always undergoing a constant shift, can you explain what is the core of tattoos/tattooing for you? M: To me, it’s all about art. 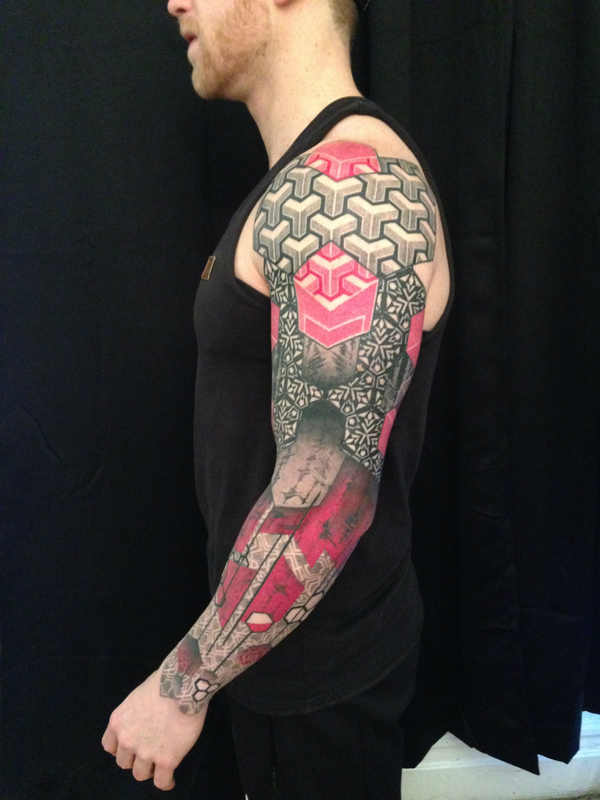 Of course, it has changed since I started tattooing, but the element that has remained throughout my career is art. I want to create something unique for each client. I am fueled by the element of creation. The challenge though, as you grow as an artist, is to constantly challenge yourself, stay true to yourself, and on top of that, stay unique. 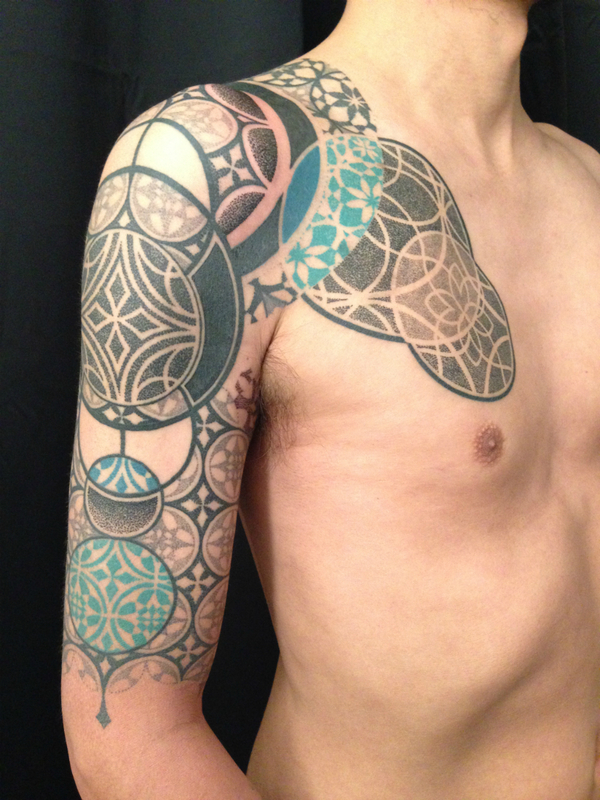 S: You are tightly knit with the traditional family of tattooing, and the modern family as well. 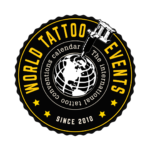 Often there’s a clash in the schools of thought there… do you think the ideas of traditional tattooing and modern tattooing can co-exist hand in hand? M: Of course, all it takes is respect for each other. Respecting the ones that laid the path before us is essential; after all it’s because of them that we can exist. And in the end, we all need each other in order to grow. New comers push us forward as in any other field. It’s all about authenticity, exchanges and good relationships. 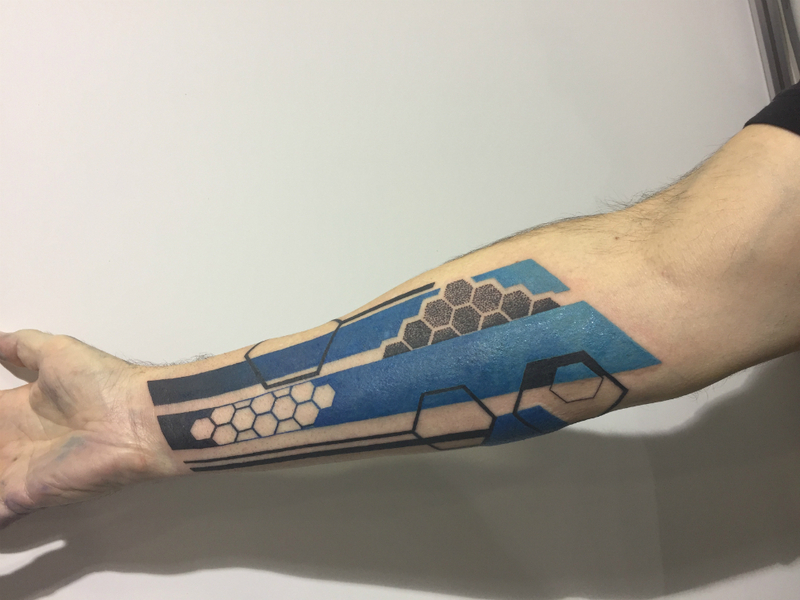 S: Till about a couple of years back, geometric tattoos were still a new genre of work that had much to explore, and suddenly now, the internet tells you that it is quite saturated maybe… What do you think? M: Well, I’m not too concerned with this and don’t pay too much attention to it. If there is saturation, I trust life to re-balance things where and when things need to be re-balanced. A new style comes out every now and then and inspires everyone. I focus on doing good work that I love and hopefully people will keep loving it. S: Your work always stands out, and that I felt was not just because your artistic elements and shapes, but also your color palettes. You use solid blacks to contrast with bright colors, which makes things very enticing for the eye. What’s logic/process behind that? M: It started with wanting to do something different. Most of the geometric work that I saw then was only black, which I love, but I also loved colors, and It was important for me to find a way to use it, that I hadn’t seen before. Now, it is how people recognize my work a lot of the time, or so I’m told quite often. S: How’s life on the road? 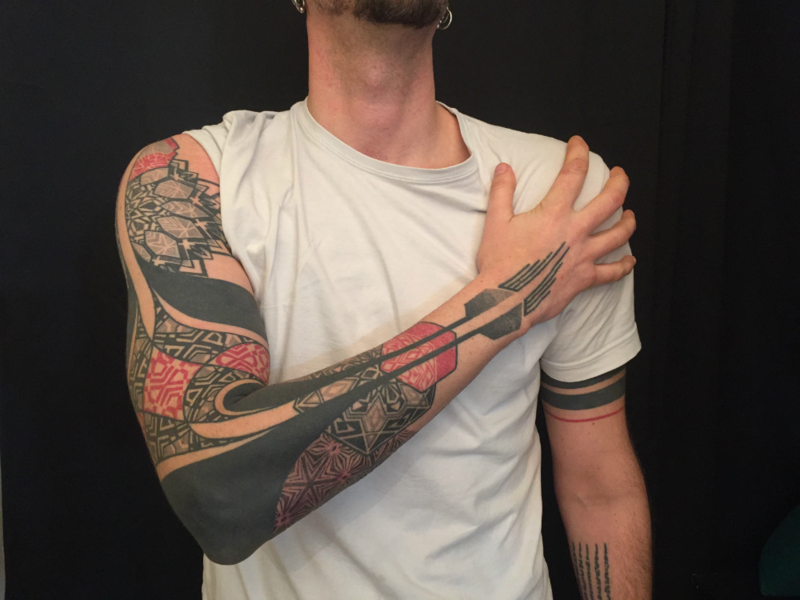 S: When it comes to tattoos, what is more important to you – the aesthetic of the design or the emotional exchange between the artist and the canvas during the process? M: I want to say it’s the whole creating process from beginning to end that is important to me. I like the challenge of putting the idea on my client and assembling the elements together. I rarely have a final design to show, I have a concept and different elements, and I go from there, live and with the client. In order to create, I need freedom, and I feel very lucky that my clients give it to me so openly, that is also really important.